We can have all kinds of careers in our lives, and there’s always going to be moments when we think to ourselves, ‘Am I on the right path here?’ And sometimes, the answer is going to turn up a little short! You know there’s something else you’d rather be doing, and you know your skills could be put to better use elsewhere – but what can you do? Changing your career takes a lot of time and effort, and you never know if the decision is going to pay off or not, especially if you’ve had a career change or two already in all your years so far! But all in all, there’s a lot of jobs out there, and any one of them could be a perfect fit for you and your lifestyle. You’ve got the experience, you’ve got other women to look up to, and you’ve got just the right amount of drive to get yourself the position you truly deserve. So let’s explore your potential career change in a little more detail, and let’s make sure you’re going about it in all the right ways. Feel free to read on if you could do with the advice! Education is always going to be a valuable asset to your life and your CV, and it’s something that we never quite remove ourselves from as we go on living. After all, we’re always learning, we’re always exploring new things, and we’re always going home with a bit of knowledge we didn’t have yesterday! It’s a wondrous thing, and at this point in your life when considering a career change, it’s going to be your best friend. You don’t have to go to university anymore to get yourself a degree, which is the number one qualification that helps a job application go through, and there’s always the online world and all of its resources. Something like Baylor University’s online MSN program could be of use to you here, if you’ve always fancied yourself in a nurse’s uniform, with a bedside manner Mother Teresa herself would be proud of! So make sure you’re schooling yourself in time for a career change, if you’re not happy with the transferable skills you’ve already got on your plate. But don’t let these skills fall by the wayside without giving them a second look; they can be of incredible use to you, considering the amount of years you’ve put into them as well. What skills do you have? What skills are you proud of? What skills could make you the most money in the modern day and age? These are all good questions to ask yourself before you let yourself give up on a chance to move onto greener pastures with earning an income. Taking advantage of everything you’ve got on the roster right now only makes sense when you’re in your 50s: you could have pages and pages under the ‘Key Skills’ section of your resume – as long as you know what they are. Give yourself a bit of an assessment here. You have both hard and soft skills, so give each one its due. At the same time, you could learn all kinds of things about yourself and your job experience that could put you in good stead for getting any kind of career out there. And make sure you factor in the good things others have said about you too! You’ve had a good job for a long time now, and you’ve got a house and a mortgage and a whole family on hand at the same time, some of whom are attending uni whilst you foot the bill – you can’t afford to make a career change at this point in your life without properly evaluating your expenses beforehand! You’ve got to find a way to keep paying for the life you know and love, and you can’t afford to take a paycut here, especially if there’s no other income flowing into your household. Sure, you more than likely have a whole savings account at your disposal, and you’re willing to use some of this to pay for everything else while you explore the premise of having a new career. But how much have you socked away over the years? You’re going to need a considerable amount in your account, and your chances of making a return on this kind of investment only thins as the time goes on with your new job search. When will you know you’ve been successful? So changing your career could be a risk, but that doesn’t mean you shouldn’t do it! Just don’t go into the idea with your eyes closed, and make sure you’ve made yourself a budget to live off of for the next 6 months that takes into account your loss of a revenue stream. Don’t worry, you’ve got a good chance of finding a position, especially when you use the next point up ahead to your advantage. A career action plan that is; it needs to be a list of ideas that all come into one, that revolve around getting yourself into this new neck of the woods, and excelling at your job whilst you’re there. So you’ve got your new career options laid out in front of you, and you want to do something about them. You want to know which one would be the best fit for you, and hopefully you’re only starting with 3 so narrowing these down shouldn’t be too tricky, and that means it’s time to prioritize. Which one of the jobs would pay the best? Which one has the best working conditions for you to thrive within? Which career that you’re thinking of would cater best to the skills you already have? Or are you willing to learn as you go? With these questions, try and order your new options on a list of 1 to 3, and proceed the same way. Look into the fields in this descending order; look for job postings, and set yourself up a network in each of the areas you’re excited about, and then set yourself some goals you know you can keep to. Make them time sensitive, say, able to be completed within the next 6 months, and then go after them with all you have. Make sure you know what you’re after, how you can go about getting it, and that you feel good about your chances. An action plan need to be effective, after all! So, How Do You Feel about Changing Your Career? 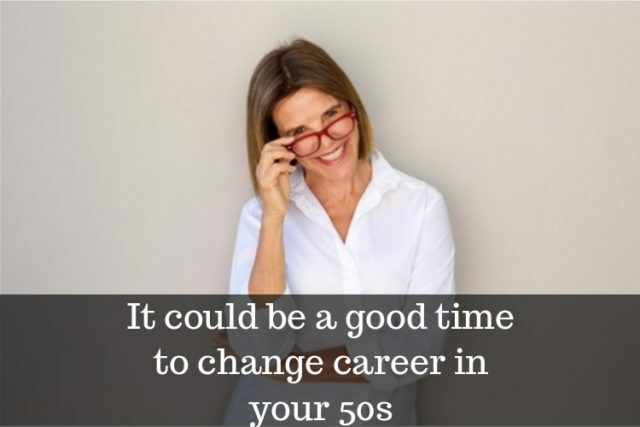 When you’re in your 50s, it might feel like a bad time to be changing your mind over what you do with your life. But when you actually think about it, you’ve still got 20 years or so before the standard retirement age, and you can work well beyond that if you’re passionate about what you do! So go into a career change at this time in your life with a clear head and some clear goals. You’ve got a lot more experience and knowhow than anyone else on the market, and all of the employers out there need to know about it! Let yourself live a little more free, and go ahead and try out for a job you just can’t seem to stop yourself thinking about.